Private Hardwood Casitas, Set on a Private Island within Lake Nicaragua. Jicaro Island Eco-Lodge is Nicaragua’s most upscale nature resort located on a private island in Lake Nicaragua. 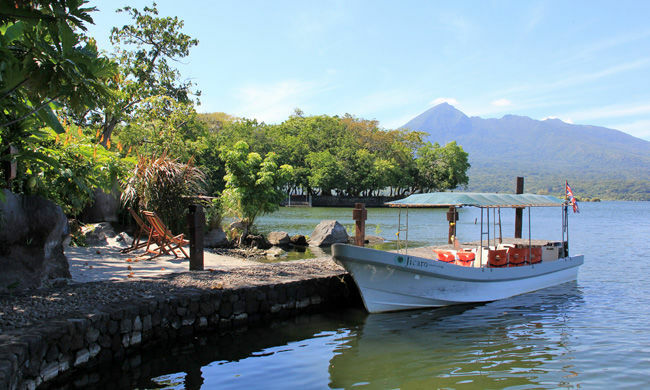 The lodge is located just a short boat ride from the colonial town of Granada with spectacular views of the Mombacho Volcano across the lake. At Jicaro, the guest stays in their own little house, a “casita”. Nine private casitas serve as the perfect setting for romantic escapes, activities, active exploration, and wellness retreats. Immerse yourself in a magical island experience filled with peace, tranquility, and access to a wide variety of tours and activities. The nine casitas on the island all have lake views and are within a short walk from the pool, restaurant, and wellness center. They are each two stories, with a private bedroom and a king-size bed on the second floo,; and on the first floor, a spacious living area that connects to an outside deck overlooking the lake. The casitas and the furniture are made locally from Rainforest Alliance-certified wood. Each casita is equipped with mosquito netting and ceiling fans, and the large doors and windows can all be opened for cross ventilation. The oversized hammock and comfy furniture of the deck invite the guest to relax and feel the peace of this magical lake. This hotel is part of our exclusive package that features luxury boutique hotels from Costa Rica and Nicaragua: Eco Extravaganza Collection.